This tropical American native, forms a large tree with dark furrowed bark and pinnate, dark green leaves to about 20 cm long and with about 10 lanceolate leaflets which are oblique at the base. The midrib on the upper surface of the leaf blade is distinctly raised. The small, fragrant flowers are in panicles, the 5 petals are cream and the staminal filaments are fused to form a tube in the centre of the flower. 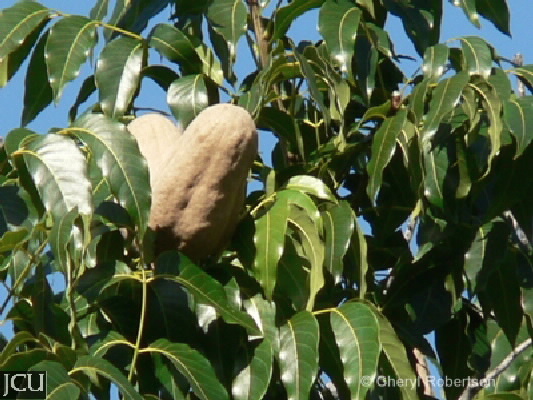 The distinctive fruits are pear-shaped woody capsules to about 12 cm long. These are held above the canopy by a thick stalk, at maturity they split from the base into 4-5 segments which, open out like an umbrella to release the numerous winged seeds. Wood is a valued timber.